To Help Catholic Charities produce a monthly newsletter for Our Lady's Pantry. 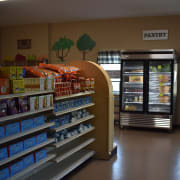 Newsletter to highlight the operation of a wellness client choice pantry that serves citizens living in a Food Desert. Need to design and layout a newsletter and also write copy as needed. This will be sent to partners, donors and friends of the pantry. Contact Maria Gray at mgray@charlestondiocese.org.